Providence Golf Club, the newest, most affordable public golf course in the metro Richmond area, has recently opened to rave reviews. The location is on a gorgeous site, once occupied by the beleaguered Pocoshock. This course was commonly known as "Poco Rock" due to its poor condition and layout. 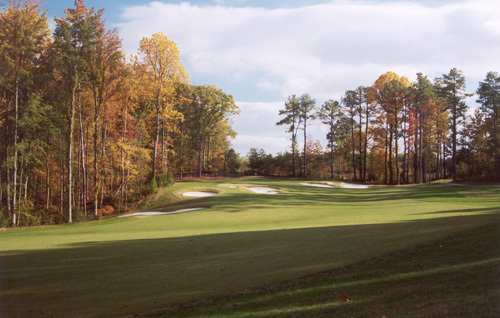 After the closing of Pocoshock, this land remained empty for a number of years until developer, Buddy Sowers, teamed with Golf Course Architect, Lester George, to create a brand new routing, incorporating additional surrounding land. The result is a beautiful and challenging golf course that looks like it has been there for decades. added water features to the site and left nothing of the original routing. Many people in the surrounding area were surprised that this land was not developed as residential, but I had hoped someone would fund the development of a new public golf course on this site. We first looked at it over ten years ago, but the funding was not there and purchases of the land fell through. Buddy came in, and we are extremely proud of the result. Sixteen years ago, I'd have designed a completely different golf course because of the lack of wetland constraints and regulations. I like what we have now better!" Providence Golf course logo, the Phoenix, was chosen because in mythology, it rose from the ashes. We feel this golf course is similar. 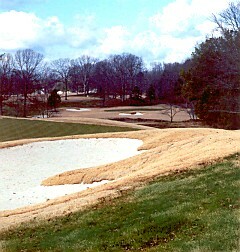 The golf course previously on this site was inadequate, but the land has yielded an amazing addition to Virginia golf. After sixteen years, Providence has arrived, arising from am amazing piece of property."